FLORENCE, S.C. – After more than 30 years of planning, studies and negotiations, the U.S. Army Corps of Engineers has issued a permit for construction of Interstate 73. 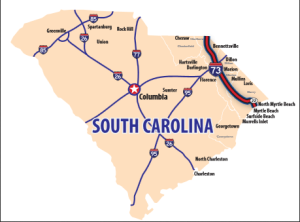 The interstate will connect Myrtle Beach to Sault Ste. Marie in northern Michigan, and will run 80 miles in four South Carolina counties — Dillon, Marlboro, Marion and Horry. In total, I-73 will cross six states — South Carolina, North Carolina, Virginia, West Virginia, Ohio and Michigan. Congressman Tom Rice, a Republican from Myrtle Beach, has made I-73 one of his major talking points since his first election in 2014 and made an official announcement Tuesday afternoon. Specific timeframes and costs were not given, but officials have said in the past that a project of this magnitude could take a decade or more to complete. A study completed by the South Carolina Department of Transportation last month indicated costs for the state’s portion of I-73 could be about $2.8 billion if construction starts this year or up to about $3.4 billion if construction is delayed until 2025. 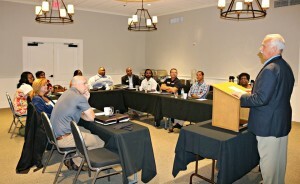 The Chamber’s Emerging Leaders Summer Institute kicked off with a leadership retreat on Tuesday, June 21st. The group heard from Teresa Johnson Ramey of Francis Marion University and Holly Young Beaumier of Florence Convention and Visitors Bureau. The group continues their five session journey in July. FLORENCE, S.C. – LilJazZi’s Café and Salads, located inside the Florence Regional Airport at 2100 Terminal Drive, held its grand opening and ribbon cutting on Wednesday. 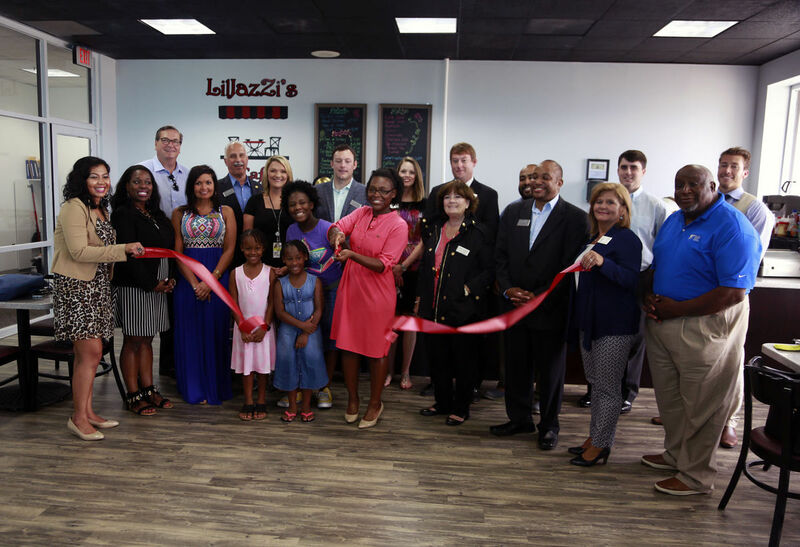 LilJazZi’s is open to the general public as well as airport travelers, offering a variety of salads and sandwiches to hungry patrons. The café also provides real fruit smoothies such as peach, mango, strawberry or any combination of flavors. The menu features breakfast items, including grits, pancakes, eggs and waffles. LilJazZi’s can also craft a number of gourmet drinks such as cappuccinos, lattes, frappes and macchiatos. Customers who dine at LilJazZi’s receive free parking at the airport for one hour and the café offers discounts for students, seniors, military and law enforcement. Owner Andrena Mullins said she collaborated with Robert Norton, the airport’s deputy director, on the idea of starting her own business after she tried to sell vending machines to the terminal. Mullins said she has always wanted to open her own restaurant and she is grateful for Norton and the Florence Regional Airport for giving her the space and the opportunity to pursue her dream. The café opened on April 14 and held a grand opening Wednesday afternoon. Ambassadors from the Greater Florence Chamber of Commerce attended the ribbon cutting to welcome Mullins and her new business to Florence and congratulate her on her accomplishment. Mullins said she has plans to open another location in the near future by the Walmart Supercenter on Beltline Drive. Mullins’ three daughters, Lilly, 7, Jasmine, 13, and Zion, 8, gave her the inspiration to name the restaurant LilJazZi’s. FLORENCE, S.C. — Hennes and Mauritz Inc., the global fashion retailer better known as H&M, announced a new location opening in Magnolia Mall in Florence. Kelsey Hill, marketing manager at Magnolia Mall, confirmed the announcement. The 20,000 square-foot store is set to open in the fall of 2018. The new H&M location will offer Florence residents a shopping destination for quality clothing for the whole family, with collections for ladies, men and teens, as well as separate “store within a store” sections for accessories. The Magnolia Mall location will also carry the H&M Kids collection for newborns to 14-year-olds. 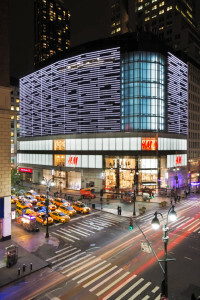 Patrick Shaner of the H&M communications department said the company thought Florence would be in ideal location for their South Carolina expansion due to their significant customer base in the area. 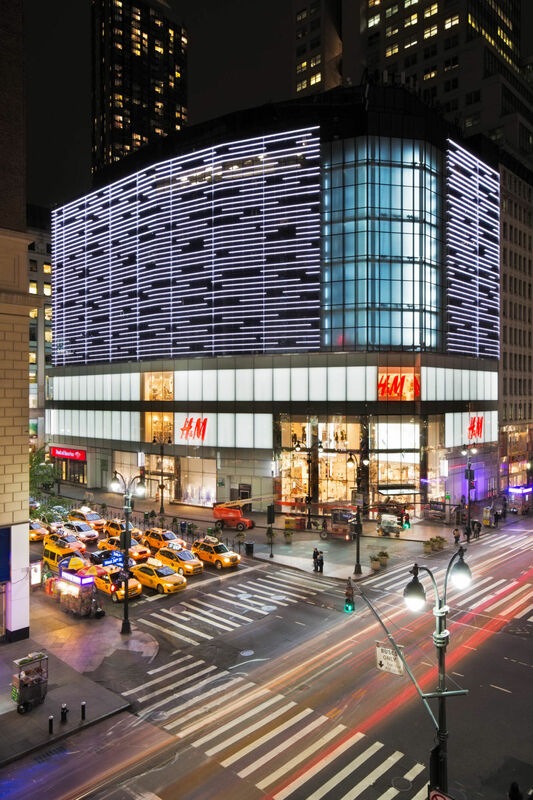 In 2017, H&M was the highest ranked fashion retailer on Forbes America’s Best Employers list and was named on Business of Fashion’s list of Best Companies to Work for in Fashion. The new store will add approximately 30 jobs to the Florence area. For available job opportunities, please visit career.hm.com. 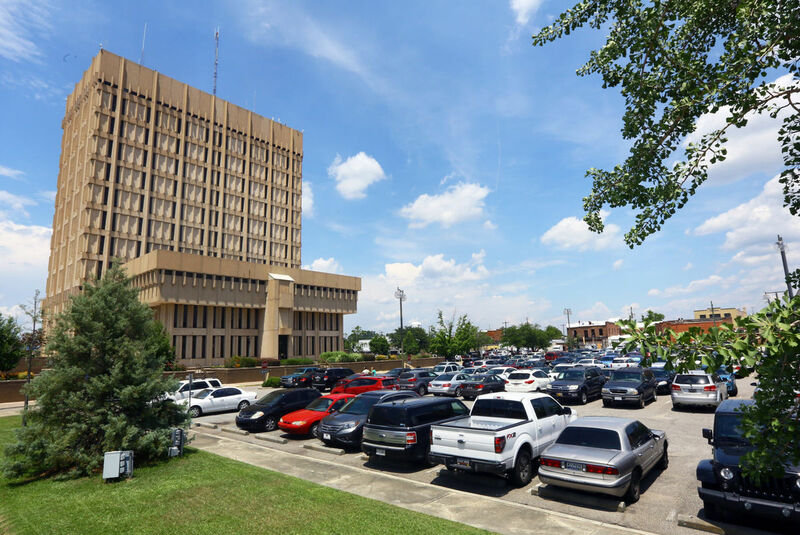 FLORENCE, S.C. – Another parking garage may be coming to downtown Florence, this time coming from the county. On Thursday, the Florence County Council took its first official step toward placing a parking garage in downtown Florence — specifically in the parking lot adjacent to the county complex on Irby Street. Officials have discussed the potential for a county-operated parking deck in that spot for years, and now the council has approved a motion to allow the county administration to search for architects and engineers for design options. Dorriety provided no specifics on how many spaces could be involved, or the price range for a new deck. A second parking deck has been a point of contention for city and county officials, with each unwilling to compromise for a joint venture. County officials have said a new deck needs to be adjacent to the complex, while city officials maintain that growth over the next five years will indicate where a deck is needed most. The city-owned 320-space parking garage at the corner of Irby and Evans streets opened for free public use last November, and cost about $9 million. The council unanimously approved a fee-in-lieu-of tax agreement with Ruiz Foods for a $79 million expansion that’s expected to create more than 700 jobs over the next decade. That agreement means there will be a 6 percent tax on the development rather than the usual 10 percent. Such agreements are common to facilitate economic development within the county. The council also approved a resolution to fund some upgrades and replacement of the county’s antiquated technology systems. Members approved a general obligation bond of up to $500,000 for the upgrades. Officials have said the IT system overhaul could take years to complete and could cost the county upward of $2 million. The current system has three parts, each handling a different aspect of county tax and financing needs. The underlying problem comes from a system that has been built upon for more than two decades by the same engineer, who is set to retire within two or three years. The current software is fully integrated and performs county tasks as intended but is outdated and will no longer be sustainable after the engineer retires. FLORENCE, S.C. – B. Nance Fine Gifts held a ribbon cutting Thursday morning after moving into its new, larger location at 1939 Hoffmeyer Road. Ambassadors with the Greater Florence Chamber of Commerce congratulated co-owners and mother-daughter duo Jill Blaker and Danielle Nance on their relocation. The retail store moved into the shopping plaza on May 1, just yards from the previous location. Nance said the move has been almost a year in the making, and she is thrilled to be settled into their new retail home. B. Nance Fine Gifts offers a wide variety of products including tabletop items, cookware and glassware from high-quality brands. Gifts for any special occasion line the shelves at B. Nance, including birthdays, weddings, baby showers and more. The store also sells candles, jewelry, sunglasses and other items. Nance said being able to open a retail business with her parents and husband combines her passion for retail and love for her family into one. Now after moving into their new space, Nance hopes she can offer Florence residents an enjoyable place to shop. 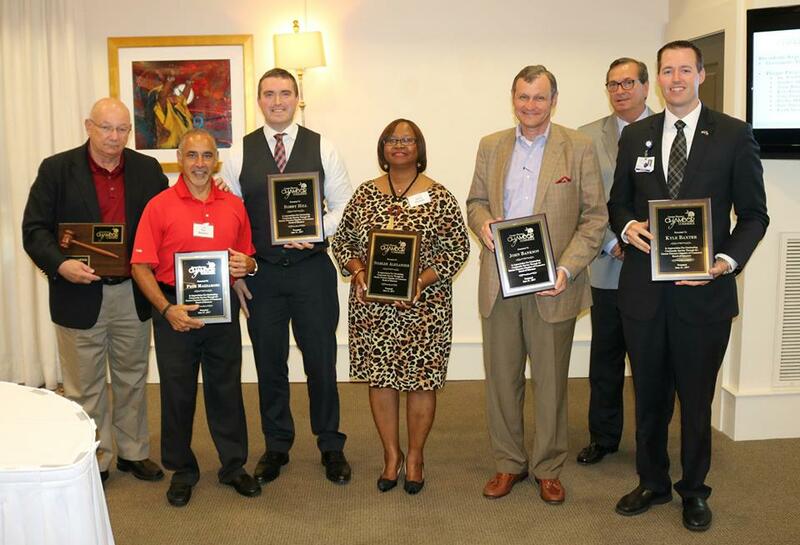 The Greater Florence Chamber of Commerce would like to thank the following outgoing Chamber board members for their time and service to the organization – Dr. Fred Carter, Pete Mazzaroni, Robby Hill, Starlee Alexander, John Bankson and Kyle Baxter. FLORENCE, S.C – A major economic development project that’s been called by the code name “Project Horseshoe” for months has been revealed as another Ruiz Foods expansion in Florence County. That project involves a $79 million investment and an additional 700 new jobs, which would nearly triple its workforce in Florence. Officials with Ruiz were not available to comment on the expansion on Monday afternoon, and details of what the expansion entails and when construction will start have not been revealed. South Carolina Agriculture Commissioner Hugh Weathers was the first to speak publically about the expansion that’s been under wraps for months. Ruiz Foods is on the Florence County Council’s June agenda, replacing the code name project. The Florence County Council previously approved two readings of the fee-in-lieu-of-tax agreement for Project Horseshoe, meaning there will be a 6 percent tax on the development rather than the usual 10 percent. In June 2014, Ruiz Foods announced the acquisition of the former H.J. Heinz facility in Florence. It said it would invest $55 million in an operation that eventually would bring more than 500 jobs to the Pee Dee. After renovating that facility, it began operation in January 2016. Last year, construction of a large freezer distribution center brought the total square footage to 225,000 of the site inside Pee Dee Touchstone Energy City industrial park. Ruiz currently has $60 million invested in the Florence facility. According to Weathers, Ruiz employs 400 people in Florence. This new project comes after several major employers announced job-creating expansions of their operations in Florence County in the past year. Honda of South Carolina announced a $45 million, 115,000-square-foot expansion; McCall Farms announced a $23 million investment; and General Electric announced a $40 million expansion. 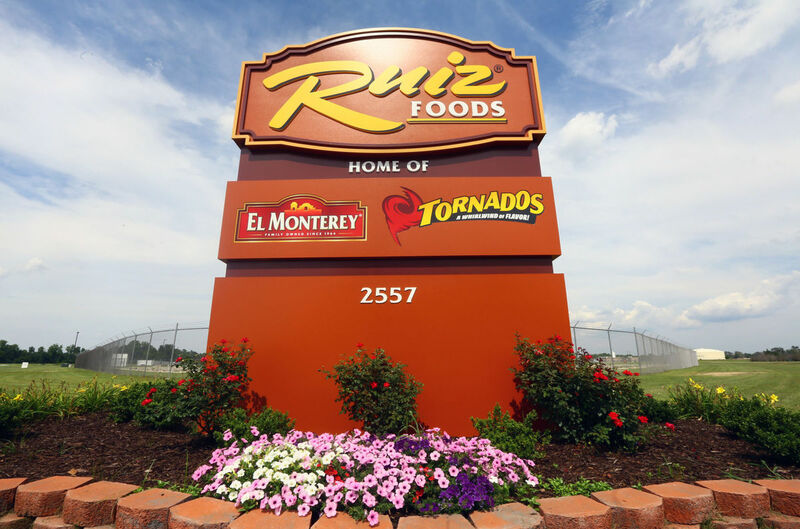 Ruiz Foods started in 1964 as a family-owned business in California and has now grown to be the nation’s leading distributor of frozen Mexican food. 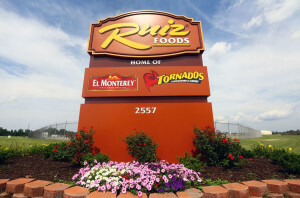 Nationally, Ruiz operates three manufacturing plants that distribute El Monterey and Tornados food products. The El Monterey brand includes retail products such as burritos, tamales and empanadas. Morning News reporter Jessica Imbimbo contributed to this report. FLORENCE, S.C. – South State Bank held a ribbon cutting and Business After Hours event Thursday evening celebrating the opening of its newest Florence location at 265 S. Irby St.
More than 50 people including bank employees, executives and ambassadors with the Greater Florence Chamber of Commerce joined in the celebration. 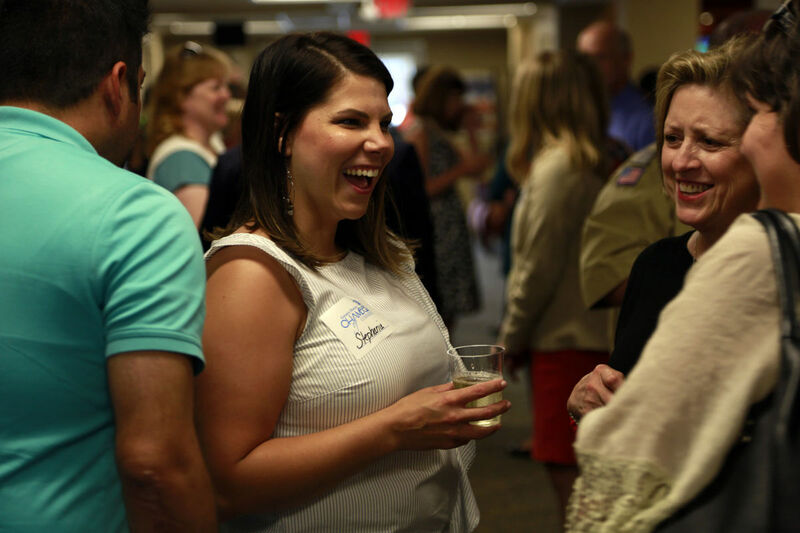 Guests enjoyed an evening of food, beverages and mingling with fellow business and community leaders inside South State Bank’s newly renovated building. The two-story office building has been under construction for more than a year after being fully renovated inside and out. 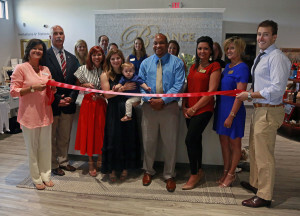 The branch was open to customers throughout the renovation process and now that the renewal is complete, South State Bank held a ribbon cutting courtesy of the chamber. The opening is the result of the consolidation of South State Bank’s branches, according to Stephanie Rodriguez, assistant vice president and branch manager. The bank closed its location at 6200 West Palmetto and moved that branch into the Legacy Bank of America office at 265 S. Irby St.
Rodriguez said the move was beneficial not only to spread on the location of their three Florence branches but to also extend the reach of the bank into the downtown historic district. FLORENCE, S.C. – Leadership Florence is a two-fold program. It develops strong community leaders and raises money for local organizations. This year’s graduating class, composed of 36 community leaders from businesses in the community, raised nearly $32,000 for local charities in less than a year’s time. 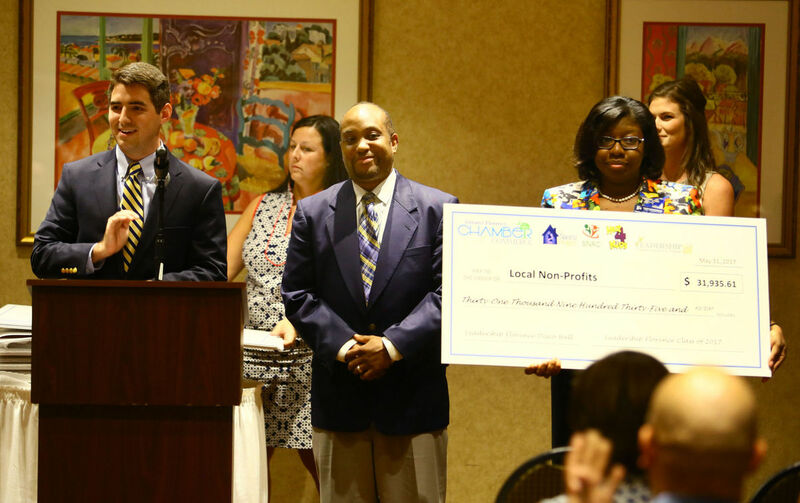 On Wednesday evening, the graduates gathered at the Hilton Garden Inn in Florence for a graduation ceremony and check presentation for the benefiting charities – Help 4Kids, The Naomi Project and SNAC. Les Echols, director of community and minority enterprise for the Greater Florence Chamber of Commerce, acts as the “principal” for each Leadership Florence class. He said the 2017 class raised more money than any other class and affected him personally with a simple card during a tough season of life after back-to-back deaths in his family. 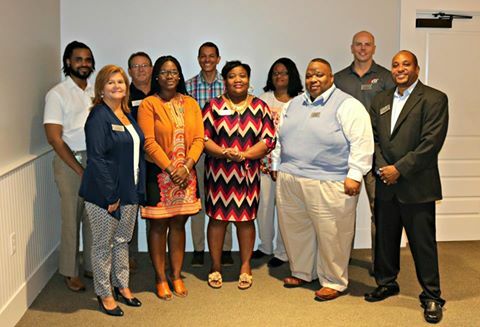 Leadership Florence is a nine-month program through the Greater Florence Chamber of Commerce, aimed at helping business leaders connect with the private sector, nonprofits, governmental and educational entities by way of hands-on activities, behind-the-scenes tours and deeper looks into this area’s industries, culture and municipal workings. Monique Maxwell, a representative if Holiday Inn & Suites in Florence and a graduate, said seeing the diversity of business leadership in Florence was a big eye opener. 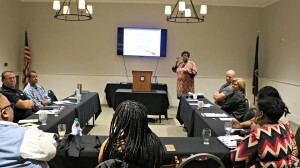 Pam Elliott, also a graduate and representative of McLeod Health, said this program showed her a side of the Florence community she’s never seen before. The chamber also has a Junior Leadership program, aimed toward high school sophomores and juniors to enable them to develop leadership skills while increasing awareness of their community. 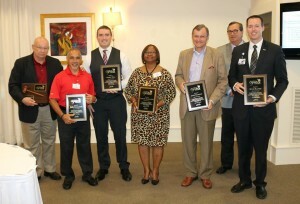 For more information about Leadership Florence and how to apply for next year’s program, contact the Florence Chamber at 843-665-0515 or visit its website at flochamber.com.